It would have to be a blog about my car, right? My first year of Jaguar ownership has not been without its share of unique experiences and a few headaches. I've been all too happy to strike up a conversation about my vehicle and the quirks that come with owning a Jaguar in a city 300km from the nearest dealership, not that I'm complaining. My passion for maintaining and teaching myself about my vehicle has never been higher - and that should say something considering how I turned my previous car, an old '89 Buick, into a character in a handful of my short films. I've always loved cars, and feeling the need to direct this energy and passion towards other enthusiastic Jaguar owners (and car enthusiasts in general) I've decided that creating a new casual blog would be the perfect outlet. 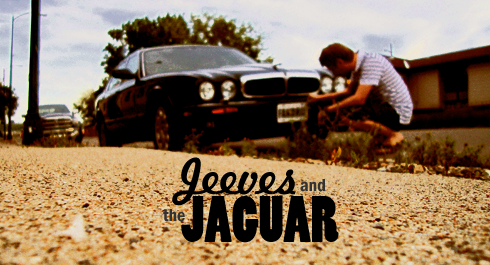 Tentatively titled, Jeeves and the Jaguar, the focus of the site will be about my first hand experiences with my '99 Jaguar XJ8. In addition to this, you can expect lots of photos, references to the vehicle in pop culture, restoration/maintenance updates/advice, features in my original videos, and day to day type stories about driving my current dream car. While Editing Luke already commands a lot of my attention, I'm aware that a new balance will have to be struck. However, I'm excited about the potential to target a more specific audience with very similar interests and see how I can bring my unique style to the project. Based on my own research for my vehicle, there aren't many blogs quite like this out there - casual advice and passion with lots of personality and a heavy slant on entertaining. Hey, it might even help a few people out. The new blog will debut June 2011. This new one is purely secondary, it just gives me more room to play and share info about the things that I've been researching about my vehicle. It's also why I'm announcing it 2 months before it happens, because I want to try and get the content prepared before just starting it with one post.